Winters will explore and learn about the culture, heritage and history of Scotland, visiting Scotland's capital city, museums, galleries and sites of historic interest. 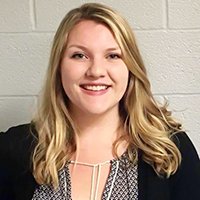 A first-generation college student, Winters aspires to a career as a clinical psychologist to help those with mental health concerns. She has conducted research in the lab of Nancy McEwain, a professor of human development and family studies, on parent and teen child relationships and attachment styles. She is a paraprofessional in the campus counseling center and also serves as the vice president of Open Ears, a wellness and peer-support student organization. The US-UK Fulbright Commission is part of the Fulbright program conceived by Sen. J. William Fulbright in the aftermath of World War II to promote leadership, learning and empathy between nations through educational exchange. Fulbright Summer Institutes covers all participant costs. In addition, Fulbright summer participants receive a distinctive support and cultural education program including visa processing, a comprehensive pre-departure orientation, enrichment opportunities in country, a re-entry session and the opportunity to join an alumni network. For more information, contact David Schug, director of the National and International Scholarships Program, University of Illinois, at (217) 333-4710 or topscholars@illinois.edu.